Philly emo revivalists Glocca Morra are calling it quits this year, but before they go out they’ve got two new songs and a farewell tour. Their final 7″ is on Ice Age Records and it’s more straight punk than some of the more Kinsella-style stuff they became known for. Listen to both tracks below, via AV Club. The tour happens this May and brings the band to NYC on May 29 at Shea Stadium. All dates are with Canadian punks Greys (who played NYC on Friday), and the Boston, NYC and Philly shows are with Brooklyn’s LVL UP. All dates are listed on the tour flyer below. 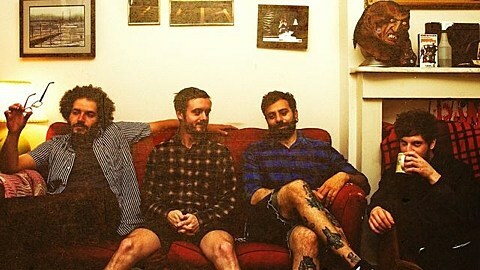 Glocca Morra’s Nate Dionne is one of the members in newer band Dogs on Acid, who released their first single last year and have now signed to Jade Tree for their debut LP which is due out this summer. The band also includes former Algernon Cadwallader members Nick Tazza and Joe Reinhardt, the latter of whom is now also in Hop Along. Dogs on Acid have four Philly shows coming up, but nothing in NYC at the moment. While you wait for the new album, revisit last year’s single below. Nate Dionne was also in the band Snowing, whose singer John Galm more recently went solo and put out the depressing 2014 album Sky of No Stars. John’s on a solo tour right now, and it hits NYC tonight (3/8) at 603 Bushwick Ave (upstairs) with Trace Mountains (another project of LVL UP’s Dave Benton) and Bethlehem Steel. All John’s dates, and a stream of his recent album, below.